This set comes with 60 beautiful belly rings to spice up any outfit, for any day of the week. They have very delicate details that you can see up close. The stones are very bright and shiny and will accentuate your belly with the perfect amount of sparkle. 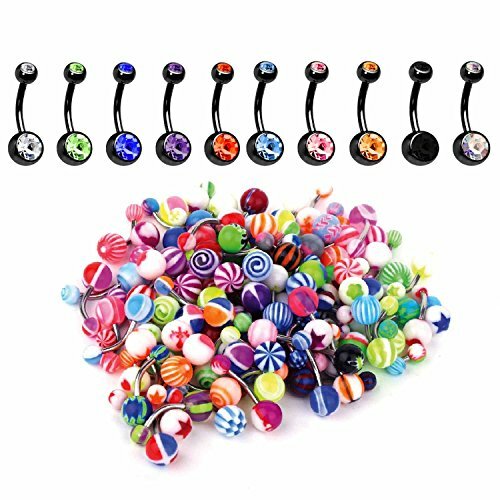 VALUE PACK: You'll Receive 10 Pieces Black Steel Double Gem Belly Rings and 50 Pieces Mixed Lot of Belly Rings with Acrylic Balls. MEASUREMENTS: Gauge Size: 14G (1.6mm). Surgical Stainless Steel Bar Length: 10mm (3/8"). Ball Size: 5mm. MATERIAL: Surgical Stainless Steel Jewelry is Very Strong, Provides Lasting Color Retention and Extremely Easy to Clean, Very Comfortable and Prevents Damage and Irritation to Your Skin. QUALITY: High Polished Smooth Surface Metal is Very Comfortable and Prevents Damage and Irritation to Your Piercing, Perfect For Daily Use.